*Or via the #RetroOnAgile Community post, of course! One of the things I love about software is its open-source DNA. When there are hundreds of ways to solve a problem and when people share their solutions openly, it creates a level playing field — where a single individual can have as much of an impact as a major corporation. This open-source culture ensures that even when the titans of software, like DHH, share their opinions, they remain just that, opinions. It was that enthusiasm that I brought to Atlassian, excited to contribute, as an individual, to the future of software development. One of the first things I learned by talking to customers was incredibly disheartening. I learned that agile software development is surprisingly not open-source. The most common question we get at any event is something to the effect of: “I’m not sure if I’m doing agile right. Can you help?” So many of Atlassian’s customers feel that they must be doing agile wrong, or that they just aren’t very good at it. They bashfully share how they “think” they’re “kinda” doing scrum as if scrum was a strict framework to be followed by-the-book. What is most frustrating for me is when someone would share how since they don’t utilize some feature in Jira Software, they must not be 100% agile. This tools-based view of agile is a huge problem, and not just for Atlassian. Any business needs to learn from its customers and any industry needs forward-thinking participants. A tools-based view of agile software development gives us neither. Agile needs open-minded, open-source thinking, and software companies like Atlassian need to take more into account than just feature requests. So many of the people I talked to equated Jira Software with agile. They expected me, as a representative of Atlassian, to tell them how to do agile “correctly.” They read the content I write for the Agile Coach as dogmatic truth. They expected their tools to define their workflows. They expected agile to be a plug-and-play process that would just happen when they rolled our Jira Software. Atlassian believes that agile is a way of thinking, organizing, and working and that our tools make agile teams more efficient. We believe in giving our customers access to all the different ways people work, and empower them to pick and choose the path that makes the most sense for them. I like: What’s one thing you like about your agile practice? 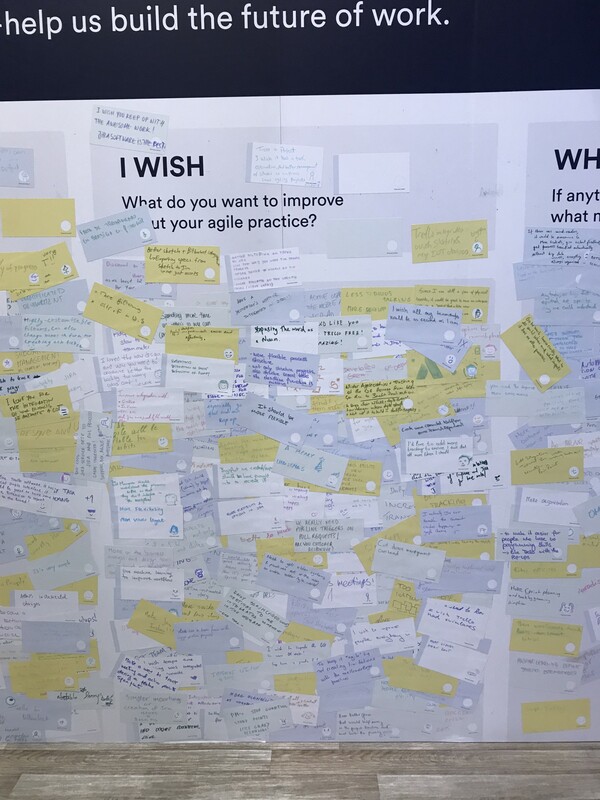 I wish: What do you want to improve about your agile practice? What if: If anything was possible, what would your software development look like? To say that our Retro on Agile board took off is an understatement. It was my job to pull people into the booth and solicit their feedback and before the first day was halfway through I could no longer keep up. Once a couple dozen cards were up I didn’t even have to give instructions. People just got it. They knew what a retro was, and they knew what worked and what didn’t when it came to their agile practice. Sure, we gave t-shirts away for participation, but people were still excited to participate long after we ran out of swag. In fact, participants were visibly relieved, even thanking me for the opportunity to submit feedback. At the end of day 1, we had to pull the stickies down, as they were glommed on too thick for the magnets to hold. It was that evening, while taking down hundreds of responses, that we knew we were on to something. By the end of Web Summit had nearly 1000 responses. I was encouraged to see the feedback. We started to learn what people wanted out of their agile practice, not just their agile tools. Calling this a retrospective, and focusing the prompts around agile, seemed to work. After analyzing the data, less than half of the cards mentioned an Atlassian product. The remaining cards, free from feature-level feedback, were digitized, categorized, and distributed to various teams around the company to consider. Since Web Summit, we’ve tested this concept in different formats and locations. We’re learning more than ever about agile, and building upon work and research that Atlassian has been doing for over a decade. Customer conversations have shifted from Jira-focused to agile-focused. From a dogmatic, “capital-A” Agile to a broader discussion of agility. We feel that we’re close, but not quite there, to bringing this conversation full circle — turning a great big discussion about agile into a great new product built for agility. To get there, we need your help. We’re opening up our retro on agile to anyone. Now it’s your turn. Tweet or comment here with your retrospective tagged with #RetroOnAgile. Reflect on your software development experience, and simply respond. 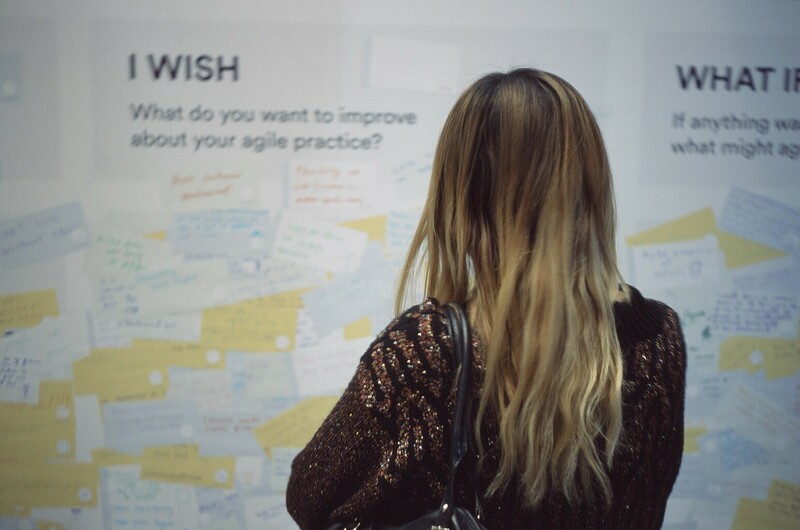 Tell us what you like about your agile practice, what you think you could improve, and what an impossibly good future for agile might look like. 2. We’ll settle for tons of Jira feedback, and build the best possible product. Your call. Either focus on agile, and help define the future of software development, or help build the next version of Jira Software, our agile tool. Either way, agility wins. 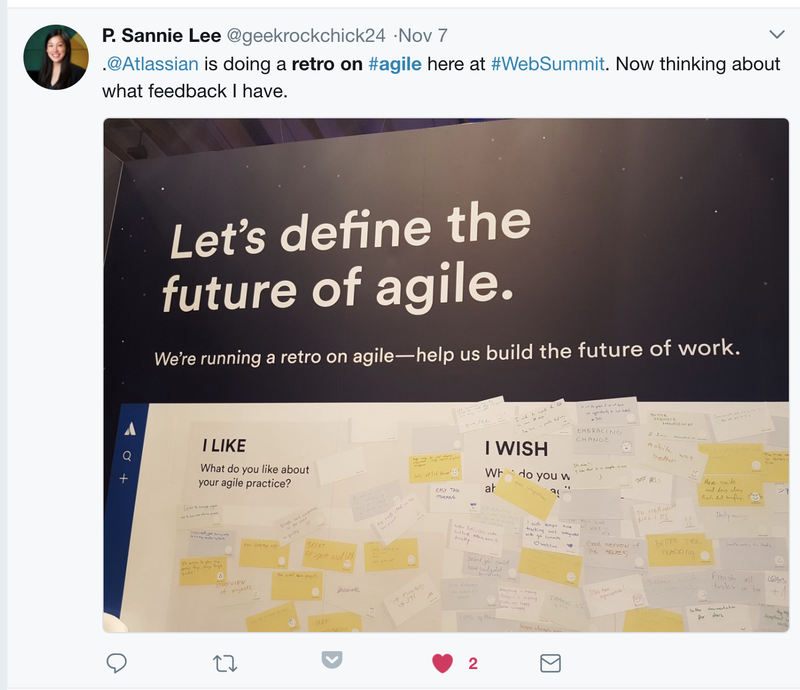 Reflect on your software development experience and follow the following links to Twitter, or on the #RetroOnAgile Community post. If you have questions for Max, don't hesitate to ask them in the comments! There is a Retro On Agile discussion happening on community here.